Stockton, Calif. - A person who was walking home late last night in Stockton sustained injuries from a machete attack. According to Stockton Police, the victim was walking on the 4400 block of Calandria in the Valley Oak District when the suspect began yelling at him. 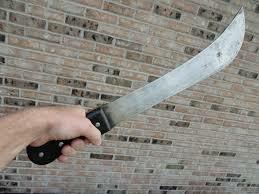 The suspect then attacked the victim with a machete resulting in a minor injury to his hand. In the attack, the unknown suspect also vandalized a door trying to get to the victim. The suspect saw another person witnessing the attack and then chased him to his residence before fleeing the area on foot. The suspect is described as a Hispanic male adult, 5’4”, thin build, shaved head, tattoos on his arms and chest. No Comment to " Victim Injured in Late-night Machete Attack "